My son, who is home schooled is entering the first grade this fall and my main area of focus is practicing sight words to ensure continued reading skills over the summer break. I am a huge fan of the Rock ‘N Learn educational DVD’s and CD’s and if I could have wished for one subject area it would definitely be a sight words DVD. 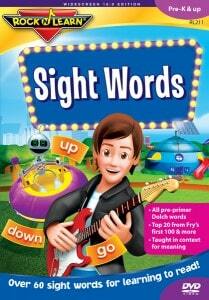 I recently learned that in fact, Rock ‘N Learn is proud to announce their latest DVD release, Rock ‘N Learn Sight Words! This title introduces over 60 sight words, which are the most frequently used words in the English language, and includes all pre-primer Dolch words and the top 20 from Fry’s. I have been practicing sight words using flash cards as a supplement to our phonics curriculum and other reading resources. My six year old son was really excited to watch Rock ‘N Learn Sight Words instead of another day of reciting flash cards. This DVD is not only educational but it teaches fun learning songs and the section titled, “Look, See, Find” was a big hit. All three of my young children were dancing, singing and performing the movements as they learned the association of the sight word. I appreciate that instead of simply learning the word by memorization, they can watch Rock ‘N Learn Sight Words and learn the context of the word by watching it in motion. Other features include practicing reading words and simple sentences which was a huge boost of self confidence to my four year old daughter. She is learning advanced pre-reading skills and enjoys watching this DVD along with her older brother. When she was able to identify a word by sight on the DVD she would jump up and down with excitement saying, “I did it, I did it…..I can read.” There is even a bonus section that focuses on word shapes and spelling. The animation of Rock ‘N Learn Sight Words is exceptional and my children always get excited to learn with their favorite characters. I have several Rock ‘N Learn titles in our home school curriculum and this is by far and away our favorite title thus far. In fact, my children want to watch it over and over again which is actually helping them to learn their sight words and I have noticed a significant improvement in my son’s identification of sight words while reading level 1 and level two books. You can purchase Rock’ N Learn Sight Words for only $19.99 on DVD (check out our exclusive savings for Simply Stacie readers) by visiting the Rock’ N Learn website. Don’t forget to check out the Rock ‘N Learn websites to help supplement learning with free resources! You can download worksheets for phonics, math and our favorite, Marko the Pencil™ which has lots of fun, free activities in various subjects! *Simply Stacie readers can save 25% on your entire purchase at Rock ‘N Learn® by using code, JQ7711 at checkout. What a great way to stock up on your favorite titles or try Rock ‘N Learn for the first time……I love money savings opportunities like these! I think my son would LOVE the Solar System CD and book…we just picked up a book at the library yesterday about the solar system and he’s nuts about it! Really any of the science books he’d love! My niece would like the Alpabet Circus dvd. I like the phonics, the letter ad sounds, and the sight words dvds. I used to be a reading/writing teacher for struggling kiddos. Best job ever! Loved it! States and Capitols Rap? I’m in! I really like the Alphabet DVD for Preschool and Kindergarten. My favorite DVD is sight words. I like Getting ready for Kindergarten! I like Multiplication Rock DVD. I like the Alphabet Exercise. Would love to get addition and subtraction rap for my kids! I really like the Sight Words DVD and Pre-K and Kindergarten DVDs. Sight Words or Pre-k and Kindergarten. Money and making change DVD. I would love the Alphabet Circus DVD for my daughter.